Since late December 2005, I’ve been reading J.R.R. 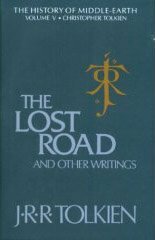 Tolkien’s The Lost Road and Other Writings. This book is the fifth installment in a 12-volume series called The History of Middle-earth, which is edited by Tolkien’s son Christopher. The series is practically required reading for huge Tolkien scholars and fans (a.k.a. Tolkien geeks) and not really read by most people. The latter have a good reason for not wanting to take up the series, anyway--for Christopher Tolkien’s 25-year labor of love is a scholarly, almost tedious attempt to chronicle the staggering mass of drafts of The Silmarillion and The Lord of the Rings written by his father. J.R.R. Tolkien was known to be unfailingly exacting with his own work--often re-writing his manuscripts, changing details, reverting to the original ideas, and making changes once more to suit his high standards. (It would have been a real nightmare to be his secretary or typist.) The process then that Christopher underwent of sifting through his father’s writings, determining the chronological order of revisions, and explaining the changes in the numerous drafts themselves seems almost as long and as painful as Frodo’s journey to Mordor. And Tolkien fans really delve into this History of Middle-earth stuff with gusto--much to the puzzlement of outsiders who think it’s extremely silly to read the drafts when the final, published versions are available anyway. Well, I would think that if some people like watching the behind-the-scenes of a movie, then others are interested in the making of a book. Needless to say, I’m a huge Tolkien fan--although there are those who really demonstrate Tolkien fanaticism to the point of studying and speaking Tolkien’s created Elvish language. I know several basic Elvish phrases (and the famous Elvish phrases in the books) but I’m pretty sure linguists and die-hard fans out there are having a field day speaking Elvish the entire time. I first read The Hobbit and The Lord of the Rings back in high school, and the feeling of discovering for the first time Tolkien’s elaborate Middle-earth at that age is still pretty much indescribable. And when I read The Silmarillion, I was sure I had died and gone to literary heaven (or into the West to the Undying Lands, if you will). I promised myself that when I was already earning my own money, I’d buy the best hardcover editions of these books. And happily enough, I have--but more on that later. I know I’m digressing from the main point of this blog entry; however, one cannot talk about The History of Middle-earth (HME) series without mentioning The Silmarillion. In case you haven't read this yet, The Silmarillion is shorter than The Lord of the Rings, yet more epic in ambition and content, and is strongly reminiscent of the pathos and spirit exhibited by heroes in mythological tales. The Silmarillion is my favorite among Tolkien’s works and it’s not an exaggeration to say I’ve read it for more than 10 times already, not including The Silmarillion drafts found in HME. When reading the drafts, I still get teary-eyed over some passages--a personal testament to the sheer genius of Tolkien’s writings. The Lost Road contains more developed drafts of The Silmarillion; in fact, these drafts (labelled as the Later Annals of Valinor, the Later Annals of Beleriand, and the Quenta Silmarillion) closely resemble the published form, save for certain details and formatting. When J.R.R. Tolkien started writing The Lord of the Rings in the late 1930s, the said Silmarillion drafts were set aside—only to be taken up many years later, when LOTR was already published. Bewildering as these drafts may be to the uninitiated, I totally enjoyed seeing the gradual progression of Tolkien’s epic story from Volume 4 (The Shaping of Middle-earth) to this, Volume 5. The High-Elves are still called the Lindar (in the final Silmarillion edition, they are known as the Vanyar) while the Elves of Beleriand--Sindarin Elves in the final edition--who are ruled by Thingol and Melian, are named the Ilkorindi here. The Vala (goddess) Nienna, the healer of hurts, is described here as the sister of Manwë and Melko, whereas in the final Silmarillion, she is the sister of Mandos and Lórien, the Fëanturi gods. There are a host of other major and minor revisions but it would be arduous to enumerate them all. The special section of this book focuses on, of course, ‘The Lost Road’ (duh), a story that was abandoned by Tolkien after a few chapters. 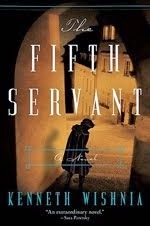 Chalk it up as one of his “Unfinished Tales.” As the anecdote goes, Tolkien and his best friend C.S. Lewis had a discussion where they agreed that the latter would write a space travel story while he, Tolkien, would write a time travel story. The fruits of that discussion were Lewis’ popular Out of the Silent Planet and this story--'The Lost Road.' As unfinished tales are wont to do, this one leaves the reader hanging and wishing that the great man had finished writing the damn thing. ‘The Lost Road’ is Tolkien’s version of the legend of the Atlantis; he originally planned that a father-and-son team would travel back in time to the Second Age of Middle-earth, where the first Men of the West were living in the island of Numenor. Father and son would find themselves caught in a tumultuous period (when the Numenoreans were starting to envy the Elves’ immortality and they questioned the reasons of the Valar for not allowing the Men into the Undying Lands). Eventually, the Valar became angry with the Men’s excessive pride and consulted Iluvatar (THE God), who decided to sink the island to teach the Men a lesson. Anyway, Tolkien decided to abort the story, skip to the last and juiciest part--the Fall of Numenor--and include this bit into The Silmarillion. And that’s that. So much for ‘The Lost Road’ story. But the Downfall of Numenor can stand on its own, and offers a lot of background details, so that’s a consolation. This volume, in true esoteric Tolkien fashion, also includes The Lhammas (‘Account of Tongues’), a long, exhaustive essay on the complex structure and relationships of the languages in Middle-earth. The geek in me was thrilled with Tolkien’s diagram of the ‘Tree of Tongues’ and his detailed account of how the speech of the various Elven groups branched out into different languages/dialects over the ages due to the sundering of the Elves. In the group of the Noldor (the Wise, the Deep Elves) alone, there were already five different dialects. Although this essay did not reach a final form, it’s still a worthy source of Tolkien trivia. Following The Lhammas is the section featuring The Etymologies, a glossary of Elvish word "stems" which explain the origin of Elvish words and their relationships with one another. This section--and The Lhammas--are really the stuff of linguists’ dreams, and I’m sure The Etymologies is considered Holy Scripture for scholars on the Elvish language. I’ve written this blog entry after the day’s work—writing surely, rapidly because it’s a subject I care about and am familiar with. On rereading what I’ve placed here so far, the entry sounds like a summary of The Lost Road and Other Writings and my ravings on this volume, but that’s okay. This is catharsis for me at any rate. Those languages were conceived, of course, from the very beginning in a deeply ‘historical’ way: they were embodied in a history, the history of the Elves who spoke them, in which was to be found, as it evolved, a rich terrain for linguistic separation and interaction: ‘a language requires a suitable habitation, and a history in which it can develop’ (Letters of J.R.R. Tolkien no. 294, p. 375). Every element in the languages, every element in every word, is in principle historically ‘explicable’–-as are the elements in languages that are not ‘invented'--and the successive phases of their intricate evolution were the delight of their creator. This is lovely lembas for thought.